A generation ago, Clay Blair published “The Forgotten War: America in Korea, 1950-1953.” It was a great book, but the title struck me as odd. After all, the book was about a past event, not our lack of memory of it. Yet the title caught on. To this day, “the forgotten war” remains to Americans the most commonly recognized label for the conflict – a fact that, if anything, impedes our understanding of its significance. In contrast, for decades after 1950 the war remained the defining event for most Koreans. In South Korea, memories of it played a central role in sustaining the alliance with the United States established in its aftermath. Over the past generation, though, memories among South Koreans of a conflict that killed millions of their countrymen have dimmed. Where they continue to exist, they are no longer uniform, meaning that they do not necessarily reinforce the alliance. That fact joins with other new realities to make essential an ongoing effort by the United States to nurture a relationship with a people whose friendship and cooperation remain very much in its interests. Stabilizing the Cold War. My own favorite label for the conflict is “substitute for World War III.” This phrase captures its centrality in the evolution of superpower relations in a manner unlikely to escalate into a direct military confrontation. In the nuclear era, such a conflagration could have made those of 1914-1918 and 1939-1945 look tame by comparison. The war started while the United States possessed advantages over the Soviet Union in mobilization capability and atomic firepower, but the Soviet Union held leads in conventional forces and the military balance in strategically critical Europe. It had also successfully tested a nuclear device, and was developing a stockpile of nuclear weapons and a capacity to deliver them to the U.S. homeland. Key decision-makers in Washington believed that the United States must greatly increase its defense spending in order to maintain a deterrent against Soviet aggression. Otherwise, by mid‑decade, the Soviet Union would probably engage in either overt military action or diplomatic intimidation that would accumulate small victories without the direct use of force. Yet the political climate in the United States in early 1950 prevented timely action to increase the military budget. The North Korean attack on South Korea, and the Communist Chinese intervention several months later, changed that. By 1953, the United States had expanded its military spending more than three times, built up its nuclear stockpile and delivery capability, augmented its forces in Europe, and made strides toward persuading its allies to permit German rearmament. Along with cultivating both broad support in the United Nations for the effort in Korea and resistance to domestic pressures to expand military operations beyond the peninsula, these moves enabled the United States to cobble together a global alliance network well-positioned for the ongoing struggle with the Soviet Union. The Soviet bloc expanded its military forces as well, but at great stress on an already-strained consumer sector. During the spring of 1953, cracks appeared in Eastern European tolerance of the Soviets’ direction, as labor strikes broke out in East Germany and unrest appeared in Poland and Czechoslovakia. Three years later, a major revolt occurred in Hungary. The combination of the U.S. military buildup at home and in Europe, successful military containment in Korea, the expansion and strengthening of U.S. alliances, and the emergence of unrest in Eastern Europe provided major deterrents to future Soviet aggression. 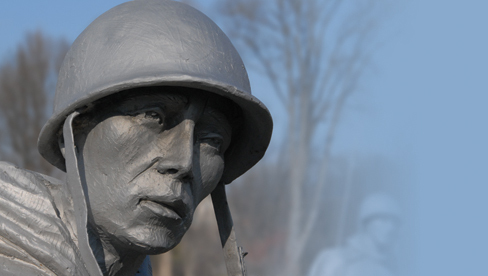 Most U.S. soldiers in Korea did not grasp the significance of their accomplishment. They were involved in a “nasty little war” in which, during its last two years, they were asked “to die for a tie.” Those who returned home safely received few of the accolades bestowed on U.S. soldiers after the world wars. Now, hopefully, they can understand that they contributed mightily to the prevention of another disaster of global proportions. Yet once the shooting stopped, it never resumed on a large scale. The United States never again let its guard down; after the armistice, the United States signed a military pact with South Korea that continues to this day. Although U.S. military forces were rapidly reduced on the peninsula during 1954 and 1955, they did not drop below 50,000 until the 1970s. More than 25,000 remain today. The security that U.S. forces helped provide gave South Korea the opportunity to build its economy into a modern behemoth that ensures a comfortable lifestyle for its people and holds its own in international trade with the United States, China and Japan. Admittedly, recovery from the war was slow. By the 1970s, however, South Korea was in takeoff mode, and its spectacular growth continued into the 1990s as democracy finally took hold. Today, most North Koreans struggle to avoid hunger and sometimes starvation, and to heat and light their homes. For the least dissent from official policy, they risk severe punishment. In stark contrast, most South Koreans commute to work in cities with impressive skylines. They drive automobiles or take modern public transportation, and experience a vibrant civil society offering a variety of political and cultural options. Foreigners arriving in the country land at the new international airport at Inchon, 30 miles from the bustling capital, Seoul, which possesses amenities equal to anywhere in the world. Among the visitors are hundreds of U.S. veterans of the Korean War, on trips often funded by grateful and proud Koreans such as the leaders of the Federation of Korean Industries. The War and U.S. Foreign Policy. While many Americans of the 1950s and 1960s wanted to forget the Korean War, U.S. decision-makers did not. The rationale for military intervention in Korea derived from lessons learned in the 1930s regarding the appropriate response to aggression. As the 1960s progressed, U.S. leaders faced critical decisions in Vietnam, and the lessons of Korea joined those of the 1930s to influence U.S. policy. The United States had fought Korea as a limited war. Avoidance of its expansion beyond the peninsula was a constant objective. However controversial the war had been at home, the original objective of containing the North Korean attack had been achieved, which encouraged the belief that the feat could be repeated in divided Vietnam. But not without challenge. In the fall of 1964, Undersecretary of State George Ball argued that there were critical differences between the two cases: the South Korean government had had the support of most of the people in its territory, but the South Vietnamese government did not; the South Korean people had been fresh with independence and willing to fight, but the South Vietnamese were tired of war, having fought a lengthy conflict against the French only a decade before; the Korean struggle had received broad endorsement from the United Nations, but Vietnam’s support from the international community was anemic at best. This difference derived in part from North Korea’s blatant, conventional military offensive against the South, whereas North Vietnam’s move into South Vietnam was merely a steady infiltration. Obviously, Ball lost the argument. But another dovish position won out. That was the belief, based on Korea, that the United States could not invade North Vietnam without sparking direct, massive intervention by the Chinese. The Korean War had been prolonged and costly, it was said, because the United States and its allies had invaded North Korea, which brought in the Chinese. Had the United States halted the ground offensive around the original dividing line between North and South Korea, the war could have been concluded in the fall of 1950. The result in Vietnam was that the United States took over the war in mid-1965 but consistently avoided major land incursions across the border between north and south. Even President Richard Nixon’s expansion of the war in 1970 was removed from China’s borders. The rationale for the Vietnam War had much in common with that for Korea. In June 1950, given the U.S.-Soviet confrontation in Korea since 1945 and U.S. sponsorship, through the United Nations, of the Republic of Korea (ROK) in the south, Washington calculated that the North Korean attack must be resisted, lest the United States lose global credibility. Similarly, the rationale for escalation in Vietnam in 1965 was that, given the investment made by the United States since 1954 to build a viable South Vietnam, acceptance of defeat would encourage future aggressors and undermine confidence among allies and neutrals in American reliability. The Vietnam War was a traumatic experience for U.S. soldiers and on the homefront, not to mention for the Vietnamese. Even so, the conflict had less impact on U.S. foreign policy than did its Korean counterpart, and that is in many ways because Korea came first, in the early stages of the Cold War, when U.S. commitments abroad remained less clearly evolved. The war in Vietnam threatened to undermine the U.S. commitment to South Korea, as the United States became especially sensitive about the use of its own troops to defend anti-communist Asian nations. In the early 1970s, Washington withdrew an Army division from Korea and considered a total withdrawal of U.S. ground forces. The flagrant violation of American beliefs on human rights by the authoritarian government of ROK President Park Chung Hee, and its efforts to influence Congress, often through bribery, produced considerable revulsion in the United States that peaked during the Carter administration. Yet South Korea had sent 50,000 troops to Vietnam, the largest contribution of any ally except South Vietnam itself. Unlike South Vietnamese units, those of the ROK consistently received positive assessments from their U.S. counterparts. At a time when calculations of the balance of power between indigenous forces on the peninsula favored North Korea, elite opinion in Washington weighed so strongly against Carter’s troop-withdrawal plan that he postponed its execution until a second term that never occurred. Anti-Americanism and Democracy in South Korea. Despite Carter’s emphasis on human rights, the United States failed to intervene, in the aftermath of Park’s assassination in October 1979, to prevent a military coup d’etat by Gen. Chun Doo Hwan. Chun’s rise to power culminated in the suppression of student protests in the provincial capital of Kwangju, with casualties running into the thousands. Many Koreans believed that the United States could and should have prevented the bloodbath. When Ronald Reagan entered the White House in January 1981, he quickly hosted Chun, at the time the ROK president, in Washington. In return, Chun commuted the death sentence of Kim Dae Jung, a leading South Korean dissident. Yet many Koreans, an increasing number of whom were too young to have direct memories of “the alliance forged in blood” between 1950 and 1953, saw Reagan’s move as the endorsement of an illegitimate leader. (Without doubt, it represented an effort to put U.S.-ROK relations on an even keel after years of turmoil.) Even the successful U.S. effort in 1987 to assist in South Korea’s transition to democracy did not erase anti-American sentiment growing out of the events of 1979 to 1981. South Korea’s democratization had long been a U.S. objective, if not the top priority. Its coming, however, produced a more open contest for power within South Korea that complicated the conduct of foreign policy, including the management of relations with the United States. Yet the United States and South Korea handled the transition from the Cold War to the post-Cold War world with considerable finesse, in no small part because of the efforts of Reagan’s and Chun’s successors, George H.W. Bush and Roh Tae Woo. Roh initiated a policy aimed at improving relations with communist neighbors in the region, including North Korea. Bush supported that initiative and, in hopes of paving the way to better relations between the two powers on the peninsula, removed nuclear weapons from the ROK. Unfortunately, an increasingly beleaguered government in Pyongyang sought to perpetuate itself, in part through the development of nuclear weapons. For much of the first decade of the 21st century, Washington and Seoul were out of sync on how to deal with this issue. This divergence helped bring anti-Americanism to the fore in South Korea as never before. Strained Alliance. Severe strains appeared in the alliance only after President George W. Bush abandoned predecessor Bill Clinton’s cooperation with Kim Dae Jung, now the ROK president, who pursued a policy of engagement with North Korea. Kim’s course sought to contain North Korea’s nuclear program and prepare the way, over the long term, for reunification of the peninsula. Bush’s none-too-subtle effort to promote regime change in the north, especially after the Sept. 11, 2001, terrorist attacks – combined with talk of broadening the mission of U.S. forces in Korea to play a regional role that might embroil them with China over Taiwan – provoked a negative response in South Korea. Then, in June 2002, a U.S. military vehicle on exercises north of Seoul accidentally killed two teenage Korean girls on their way to a birthday party. The U.S.-ROK status-of-forces agreement clearly gave U.S. authorities jurisdiction in the matter, but many in South Korea were outraged at the lack of ROK sovereignty. The outrage grew that November, when a U.S. military court acquitted the two soldiers involved in the accident. That decision occurred on the eve of a presidential election in South Korea. Progressive candidate Roh Moo Hyun rode to a narrow victory on a wave of anti-Americanism among Koreans younger than 40. Incumbent Kim Dae Jung was a progressive as well, and he had a mixed past with the United States. His relationship with the second Bush was shaky at best. Yet he was old enough to remember American sacrifices during the Korean War. He remembered as well that timely U.S. intervention had twice saved him from death at the hands of ROK military dictators. He was widely traveled, had many American acquaintances, and was a longtime and thoughtful observer of international politics. In contrast, Roh was 22 years Kim’s junior, knew little about foreign policy and had never traveled to the United States. Beholden to a constituency with no memory of the Korean War, who viewed North Korea as a wayward cousin to be encouraged to rejoin the family rather than an ongoing security threat, and the United States as a supporter of ROK dictators in the past and an overbearing bully in the present, Roh was bound to prove a volatile mix with Bush in managing the alliance. Clearly the two leaders wanted it to continue, at least for the short term. By the end of 2004, however, the United States had withdrawn 9,000 troops from the ROK to fight in Iraq and had announced a pending withdrawal of 12,500 on a permanent basis, as well as a retreat of remaining units to positions below Seoul, where they would no longer be vulnerable to North Korean artillery. ROK leaders suspected that the motive for the last move was either to prepare for the abandonment of South Korea or for a military strike against the North. In March 2005, beset by a variety of unresolved alliance issues and burgeoning trade, investment and cultural interaction with China, Roh floated the idea that the ROK become a disinterested “balancer” between that rising Asian power and the United States. Talk of the ROK moving toward neutrality declined over the next two years, as South Koreans increasingly saw the potential downside of China’s growing influence and experienced few positive returns from its efforts to reach accommodation with North Korea. When North Korea exploded a nuclear device in the fall of 2006, Kim’s prescription appeared all the more compelling. As for the Bush administration, mounting troubles in Iraq and Afghanistan helped produce some humility, including a recognition that, at least for the short term, regime change in North Korea was not a realistic option. Shortly after North Korea’s nuclear test, the American people weighed in on Bush’s overall performance by giving the Democrats control of Congress. Early in 2007, the president made a preliminary agreement with North Korea on its nuclear program that represented a retreat to the Clinton approach. Hope and Memory. Agreements on a variety of issues, such as cost sharing in the withdrawal of U.S. forces from the Yongsan military base in Seoul to points farther south and the mission of U.S. forces in the ROK, remain unresolved, a reminder that successful relationships require constant nurturing. Memories can assist in that process, as well as impede it. For example, South Korea conservative Lee Myung Bak’s assumption of the presidency in early 2008 sparked an effort to revise public-school textbooks. Over the period of progressive governance of the ROK, critics bemoaned “Korean War illiteracy” among the young. Now the Ministry of Education, Science and Technology moved to revise textbooks to both increase coverage of the war and to remove ambiguity about its origins (i.e., to make North Korea’s responsibility clear). In the United States, President Barack Obama last year proclaimed July 27 “National Korean War Veterans Armistice Day,” the first case in which a day has been set aside to recognize the contribution of those who served in a single war. The move reinforced earlier ones, such as the dedication of the Korean War Memorial in Washington in 1995, to create and perpetuate memories of a pivotal conflict of the Cold War. For the moment, the convergence of personalities, memories and conditions in Northeast Asia augur well for the U.S.-ROK relationship, and that is good news for stability in a region central to global well-being. Still, the passing of time and the rise of democracy in the Republic of Korea, as well as the growth of its prosperity and power, have encouraged a mix of viewpoints in South Korea that includes criticism, sometimes severe, of the United States. Positive memories of past collaboration and shared sacrifice, such as during the Korean War, can assist in keeping such views in check, just as awareness of the successful multilateral diplomacy of the United States during that conflict can remind us of the virtues of patience and flexibility in confronting challenges to national interests. The world has changed dramatically since the early 1950s, but the period continues to provide useful guidelines as we look to the future. William Stueck is a distinguished research professor at the University of Georgia, and the author of “Rethinking the Korean War” (2002) and “The Korean War: An International History” (1995). The National Museum of the U.S. Air Force in Dayton, Ohio, is unveiling its renovated Korean War exhibit area today, and will host a free public Freedom’s Call Military Tattoo featuring music, fireworks and flyovers on the grounds of the museum and Wright-Patterson Air Force Base on June 25. A public memorial ceremony is scheduled for 5 p.m. June 26 at the Korean War Memorial in downtown Dayton. A planned 2010 groundbreaking for the Korean War National Museum in Springfield, Ill., was postponed due to the economic downturn, and the museum’s financial problems continue. However, the Denis J. Healy Freedom Center, a 10,000-square-foot temporary exhibit, opened in downtown Springfield in 2009. Its displays and informational panels will eventually become part of the permanent facility. The Harry S. Truman Library & Museum in Independence, Mo., is holding a “Memories of Korea” exhibit running from March through December. The Little Angels Children’s Folk Ballet of Korea embarked this month on a 16-nation tour to honor the countries that sent troops to South Korea. Tour cities in the United States include Washington, Fort Benning, Ga., and Atlanta.